regulations dictate salary administration procedures for certain employees. University has the right to modify the Guide at any time. Compensation department in WFMO at 865-5280. 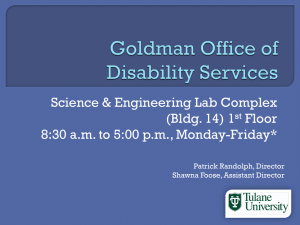 1967, and Title I of the Americans with Disabilities Act of 1990.
experience at Tulane University unique. that loyalty and commitment are two-way streets. will inspire you with endless opportunities to stimulate your life and mind. University provides you with a wide range of opportunities to contribute. competencies, and understanding their role in the University’s success. Our Total Compensation Philosophy is shaped by the following guideposts. individual and University performance results. superior performers can grow and develop for their entire working career. • Encourage and reward employees to exceed performance expectations. responsibilities or who step up in understaffed situations. • Provide employees at the lowest grade levels with a respectable living wage. 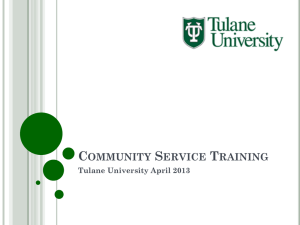 • Link employee pay to the success of Tulane in achieving its mission. that each element receives its proper emphasis. knowledge, skills and competencies that relate to success on the job. factors will influence an employee’s base pay increase. changes by 15% or more. address inequities that arise relative to a job’s pay compared to the market. 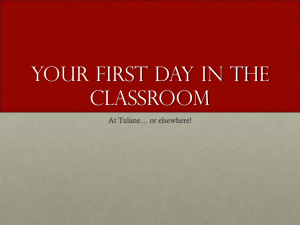 are perceived as fair, and that recognize and encourage longevity with Tulane. by employee group, as follows. be at the median of University or nonprofit peer companies nationally. the median of University or General Industry peer companies in the Region. median of General Industry in the greater New Orleans area. • Have a good understanding of how their base pay is determined. • Understand the role and value of their benefits. must be in the same format. There are many advantages of thoughtful, well-organized job descriptions. be utilized to measure an applicant’s qualifications for the job as well. organization and how their work helps achieve the organization’s goals. provide a basis for constructive training and development activity. performance over a period of time. Standards Act and assist in determining the proper EEO classification. as the Americans with Disabilities Act (ADA). (limit on the rate an employer will pay for each job). 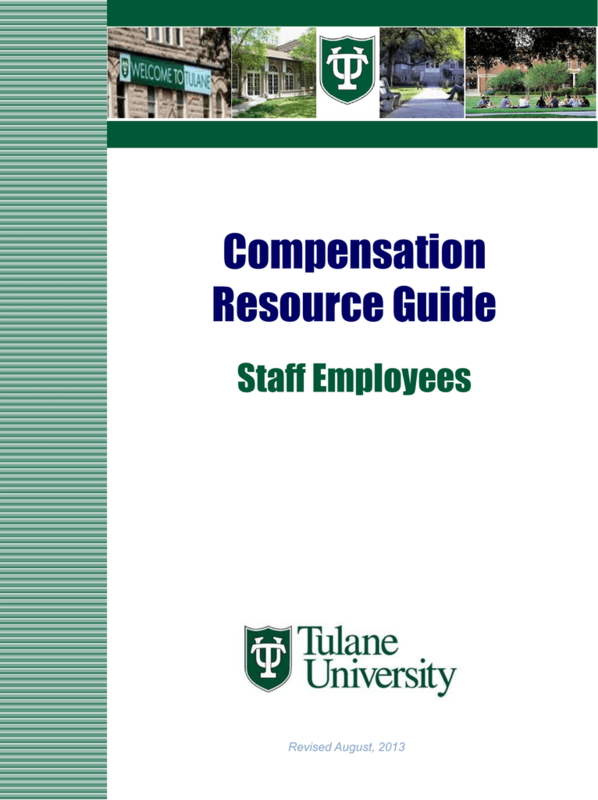 pay ranges serve as a key cost-control mechanism for Tulane. WorldatWork Annual Salary Budget Survey. made to reflect the findings of this comprehensive review. are assigned and do not result in automatic changes to individual salaries. Salary structure adjustments are normally effective January 1 st of each year. responsibilities assigned to a job. comprised of the following four factors. • Complexity is the total knowledge and thinking required in the job. expertise in one or more fields of education, management or science. to overcome difficult and complicated challenges. interpersonal skills needed for the incumbent to be successful in his/her job. employee's salary and the department's basis of assumption for the new salary. must be reviewed by OIE. the new pay grade maximum. considering internal pay equity regarding a proposed new hire salary. delivery to the new employee. what the job expectations, annual goals and annual development plan will be. 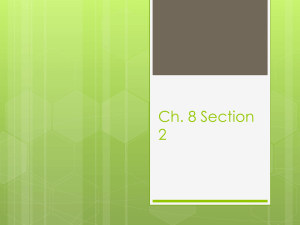 ensure an understanding of the required job duties and responsibilities. employees and supervisors regarding job expectations and performance. prescribed format, must be submitted to WFMO by March 15 of each year. positions are classified in this Guide. • Performance . Creating a high performance culture starts with paying-forperformance and ensuring that Tulane retains its highest performers. had the greatest proportion of their income diverted to living cost increases. job over the course of the year. revisions of the salary structure catch up. percent as Tulane’s overall salary increase budget. 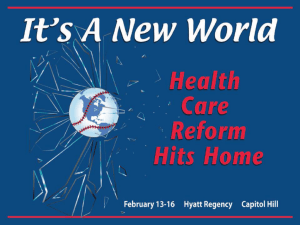 year, contingent upon available funding. six consecutive months to be eligible for a promotion. and including the employee’s resume. also will be forwarded to the department by the Compensation Analyst. 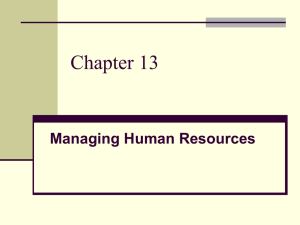 paperwork via the Human Capital Management system to initiate the change. formally promoted into that job. at least the minimum of the grade. decreased if it is currently above the maximum of the new grade salary range. 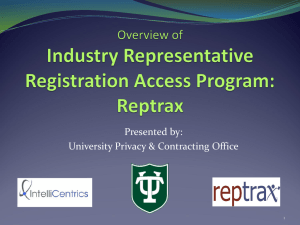 compliance with federal and state job discrimination laws. the creation of that culture provided the administration of same is consistent. event concludes and require pre- and post-approval by a senior officer. years, most importantly in August 2004.
assessed the University for violations. positions, additional payment for any overtime work performed is not required. of increased salary or lump sum payment. duties and responsibilities are not normally a part of that employee’s position. for review and approval prior to making such assignment. to be performed outside normal work hours (e.g. teaching a class). matters that impact the department significantly, as defined by the FLSA. Non-exempt employees are required to account for incremental days worked. be charged against sick leave accrual time. week is defined as any consecutive seven-day period of time. pay for all hours actually worked in excess of 40 hours in a single work week. Vacation and sick leave do not count as time worked in determining overtime. carried over into another work week or another pay period.